Barbara W. Tuchman—the acclaimed author of the Pulitzer Prize–winning classic The Guns of August—once again marshals her gift for character, history, and sparkling prose to compose an astonishing portrait of medieval Europe. The fourteenth century reflects two contradictory images: on the one hand, a glittering age of crusades, cathedrals, and chivalry; on the other, a world plunged into chaos and spiritual agony. In this revelatory work, Barbara W. Tuchman examines not only the great rhythms of history but the grain and texture of domestic life: what childhood was like; what marriage meant; how money, taxes, and war dominated the lives of serf, noble, and clergy alike. Granting her subjects their loyalties, treacheries, and guilty passions, Tuchman re-creates the lives of proud cardinals, university scholars, grocers and clerks, saints and mystics, lawyers and mercenaries, and, dominating all, the knight—in all his valor and “furious follies,” a “terrible worm in an iron cocoon.” Praise for A Distant Mirror “Beautifully written, careful and thorough in its scholarship . . . What Ms. Tuchman does superbly is to tell how it was. . . . No one has ever done this better.”—The New York Review of Books “A beautiful, extraordinary book . . . Tuchman at the top of her powers . . . She has done nothing finer.”—The Wall Street Journal “Wise, witty, and wonderful . . . a great book, in a great historical tradition.”—CommentaryNOTE: This edition does not include color images. I feel like the biggest history nerd for managing to sit through the entire 28+ hour audiobook of A Distant Mirror by Barbara W. Tuchman. Y’all, medieval history is totally MY FAVORITE EVER so of course when I see a nice, juicy audiobook that’s very, very long and it’s all about my two favorite medieval events, I snap it up and eventually listen to it. Yet, I am of two minds when it comes to A Distant Mirror — I liked the content very much, but I found myself consistently zoning out while listening, unfortunately. A Distant Mirror by Barbara Tuchman covers the 14th Century which is kind of totally baller, in that THANK GOODNESS I WASN’T ALIVE THEN sort of way. I mean, okay there’s courtly love and chivalry and all of that which is awesome. But then you also have to think that it was probably smelly, people had bad teeth, plus all of the diseases. As some one who is so not a fan of being sick or being dirty, I found myself thankful for living in the twenty first century. Anyways, A Distant Mirror uses the historical figure of Enguerrand de Coucy who is this French noble guy to give the book some context and to put everything into a human perspective. What really peaked my interest while listening to A Distant Mirror were the parts that focused on the Black Plague and the parts that focused on the various Crusades. Seriously, I bizarrely love reading about the Plague and how people didn’t know it was carried on fleas. Yo, some people blamed cats for it. They also blamed other things too. But anyways, every time she came to a part about the plague and how it decimated populations, I was like this feels like a dystopia but in real life. You see, there were like four different Black Plagues which messed up the population of Europe every time and it ended up screwing with the social structure because plenty of nobles died. THEN okay, the Crusades! So you guys instead of the French and the English fighting each other, one of the popes got the bright idea to fight for the Holy Land and unite Christendom and issues a papal bull. Then all these young men are like yeahhhh let’s fight because they were typically younger sons and thus not going to inherit, so going to Crusade meant they could make a name for themselves and find their fortune. Yah, I could go further into how cool all that bloody battle is, but chances are you are not nearly as weird as I am and thus don’t want to hear about it. So, if you have a passing interest in the medieval era and maybe want to brush up on your history but don’t want to read a book that’s going to make you feel stupid because it has nothing but jargon, then you should definitely read A Distant Mirror. It’s very easy to read and never feels convoluted. Plus, it’s very human and pulls you right into the 14th century. You don’t feel like a distant observer while reading, ya know? I think the use of de Coucy helps with that because he provides this central figure to focus on. Unfortunately, where I have to get a bit critical is in my evaluation of the audio portion. Y’all, I hate to cop to this, but I totally zoned out continuously during A Distant Mirror. It’s very long and I guess I have a hard time listening to one person speak academically for a very long time. Now, this is on me, not on the audiobook production. However, at times there would be a very weird, very faint sort of static when I was listening to the audiobook and I know it’s not my phone or my speakers so that definitely threw me off. Nadia May narrates this 28 hour 38 minute audiobook and it’s produced by Blackstone Audio. I think if you’ve got a lot of things on your mind or are easily distracted you should probably listen to something else. Honestly if you are like me as far as attention span goes, I’d actually recommend reading a physical copy rather than the audiobook, because the content is utterly fantastic but I can’t exactly sing the praises of the delivery. I can’t seem to find any from book bloggers, if you’ve reviewed this book leave a link in the comments and I’ll add it. Oh man, my step-grandfather is ALL about Barbara Tuchman. He pretty much ordered me to read some, but…I haven’t. However, I did find The Guns of August at Goodwill, so I’ll get to that someday. I’m less about medieval and more about WWI/WWII/Vietnam War/Russian History. Oh dear, I hate the audios that make me zone out. I blame the narrators. Sometimes I can multitask and miss nothing, but sometimes I could sit in a dark room listening to the book and doing nothing else and still zone out. Ugh. If you were alive in the 14th century, you would be SO OLD now. Just saying. To be fair, the cats did carry the fleas. 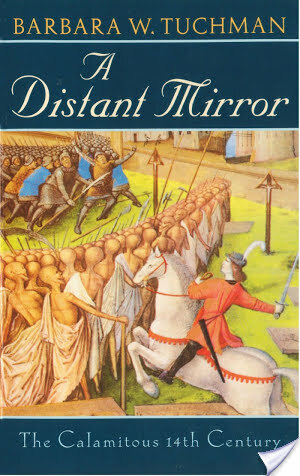 I love this: ” A Distant Mirror by Barbara Tuchman covers the 14th Century which is kind of totally baller, in that THANK GOODNESS I WASN’T ALIVE THEN sort of way. I mean, okay there’s courtly love and chivalry and all of that which is awesome. But then you also have to think that it was probably smelly, people had bad teeth, plus all of the diseases.” LOL ! I recently listened to Nadia May – Blackstone production of Elizabeth von Armin’s Elizabeth and Her German Garden and I totally get what you mean about zoning out and the static. Also Nadia seemed to pause after every sentence which was kind of odd. I wish I had read the physical book instead. A good narrator and good production are SO important. This really does sound interesting, I just read Scarlet and it mentions the Crusades because Robin Hood fought in them and you’re so right about how awful it would have been to live back then, but like you I find it all really interesting too, especially the Plague. I think the best way to read this would be via audio like you, I could see myself listening to this on the drive to/from work. Also, this period of history is absolutely one of my favorites. Black Plague? Heck yes. Crusades? Dude, I’m on that. Am I a little dark in my love of history? Maybe so, but I can’t help what I love. Props to you for sticking this one out, especially if the audio was less than stellar.